Bare or dying branches on a Colorado blue spruce tree are commonly caused by a few different insect pests or one or more diseases. All of these problems can be exacerbated by drought stress, poor soil conditions, mechanical damage, and climatic conditions such as high humidity. Dying branches (branch dieback) or branches that are shedding needles are common symptoms of Colorado blue spruce trees and often attributed to either of two insect pests: aphids or the Cooley spruce gall adelgid. These two insect pests look similar, so accurate identification requires a close look. The best way to tell if you have an infestation of Cooley spruce gall adelgid is to look for a cotton-like substance on tree branches. These are the insects' egg sacs. 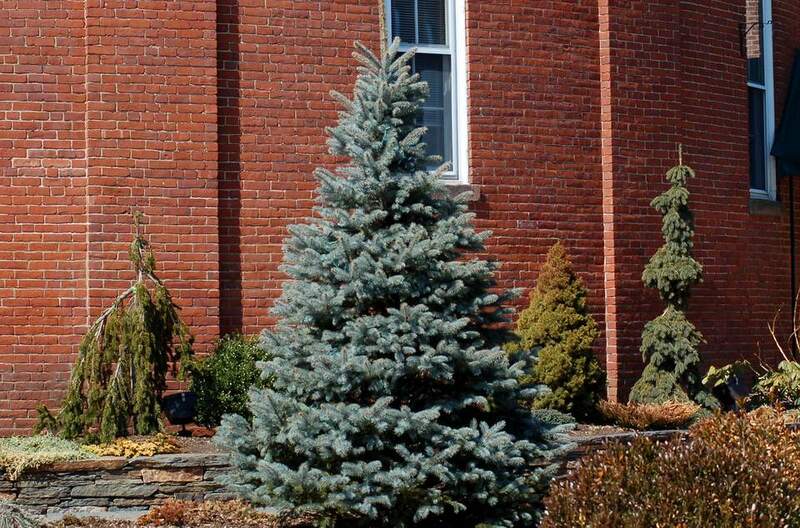 Aphids that commonly attach Colorado blue spruce are also called spruce aphids. They are about 1/16 inch long and can be found in great numbers on the needles of the tree. Mature spruce aphids have olive-green bodies (young aphids are a lighter green) and two sets of wings. If you see gall adelgid or aphids on your Colorado blue spruce tree, try spraying first with Neem oil. It's organic, and it won't hurt to see if the Neem oil can solve the problem. For ongoing problems with these insect pests, you can take preventive measures—but it requires good timing. For aphids, you can spray in January, when their life cycle begins. For Cooley spruce gall adelgid, apply a dormant oil spray in late-October and early-November. You can't spray actively growing trees because it can cause new growth to burn. Cytospora canker: A fungal disease that affects older spruce trees, most commonly those more than 15 years old. Symptoms include branches with brown needles that fall off or may stay on the branch as well as a white residue that looks like bird droppings. The residue is caused be resin oozing from infected parts of the tree. The lowest—and oldest—branches usually die first, followed by higher branches as the problem worsens. Affected branches should be pruned off in winter when the tree is dormant (sanitize the pruning tool between cuts). The only other treatment is to care for the tree to improve its vigor and to minimize drought-stress through diligent watering. There is no chemical treatment for the disease. Needlecast: The common name for various fungal diseases, including Rhizosphaera, Stigminia, and others, needlecast diseases cause spruce trees to shed their needles. The disease usually infects new shoots at the ends of the branch, but the infected needles don't die until the next year, creating an odd pattern where trees have an outer layer of live needles surrounding dead inner needles. Needlecasts can be controlled somewhat with fungicide treatment, but this protects only new growth; it does not revive dying branches. Fungicide treatments may need to be repeated for two or three years for maximum effectiveness.